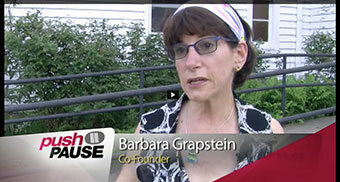 Barbara Grapstein, CHP and Joanie Accolla are the Co-Founders of the nonprofit organization "Healing Headbands Project." The purpose of the Healing Headbands Project is to inspire others to develop a healing mindset by integrating laughter with art. Those that participate with the project realize their full potential through laughter exercises that awaken the creative mind. Those participants then express themselves through painting, and that artwork is custom printed on special soft UV protected fabric and made into headbands. The headbands not only protect the heads of those especially struggling through cancer treatments and other illnesses, but act as a symbol of joy and happiness. That happiness is a state of mind and the headband is a reminder to wear your happiness every day. Barbara and Joanie do events to help create laughter and artwork at local hospitals, community centers and schools. They recently teamed up with the North Shore High School Key Club to focus on how to add joy to the lives of children facing devastating illnesses. Key Club members painted colorful collages that were made into headbands and wrist bands, and were then given to children to wear in health and happiness, knowing that each one was made with great intention, love and care.